can fix nitrogen from the air, converting it into ammonia. They have actinorhizal root nodules on their roots in which the bacteria live. This process enables the tree to live in low nitrogen habitats where they would otherwise be unable to thrive. Researchers have discovered that certain plant hormones called cytokinins initiate root nodule formation and that this process is closely related to the mechanisms involved in mycorrhizal association. It has been demonstrated that some trees are interconnected through their root system, forming a colony. The interconnections are made by the inosculation process, a kind of natural grafting or welding of vegetal tissues. The tests to demonstrate this networking are performed injecting chemicals, sometimes radioactive, in a tree, and then checking for its presence in neighbor trees. Buttress roots of the kapok tree (Ceiba pentandra) The roots are, generally, a subterranean part of the tree, but some tree species have evolved roots that are aerial. The common purposes for aerial roots may be of two kinds, to contribute to the mechanical stability of the tree, and to obtain oxygen from air. An instances of mechanical stability enhancement is the red mangrove that develops prop roots that loop out of the trunk and branches and descend vertically into the mud. A similar structure is developed by the Indian banyan. Many large trees have buttress roots which flare out from the lower part of the trunk. These brace the tree rather like angle brackets and provide stability, reducing sway in high winds. They are particularly prevalent in tropical rainforests where the soil is poor and the roots are close to the surface. 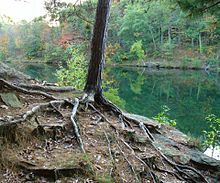 Some tree species have developed root extensions that pop out of soil, in order to get oxygen, when it is not available in the soil because of excess water. These root extensions are called pneumatophores, and are present, among other, in black mangrove and pond cypress.